OTTAWA -- Aung San Suu Kyi must publicly condemn the atrocities being committed against Rohingya Muslims in Myanmar, or else her rhetoric and global reputation as a champion of human rights will mean nothing, says Prime Minister Justin Trudeau. 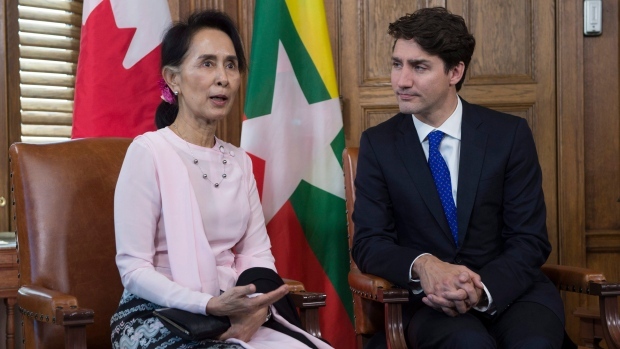 "It is with profound surprise, disappointment and dismay that your fellow Canadians have witnessed your continuing silence in the face of the brutal oppression of Myanmar's Rohingya Muslim people," Trudeau wrote Monday in a letter to Suu Kyi, the de facto leader of Myanmar. The powerful military in Myanmar is accused of burning down the homes of Rohingya Muslims, forcing more than 400,000 members of the persecuted minority to flee to neighbouring Bangladesh, according to the latest UN figures. Suu Kyi, an honorary Canadian citizen and a long-celebrated Nobel Peace Prize winner, has come in for withering international criticism for failing to stop -- or even speak out against -- the violence. The letter from Trudeau, which follows a telephone call last week, outlines the reports of what Zeid Ra'ad al-Hussein, the UN High Commissioner for Human Rights, recently called "a textbook example of ethnic cleansing," including extrajudicial killings, burning villages and land mines. It was released publicly Monday after the prime minister made reference to it in a joint news conference in Ottawa with British Prime Minister Theresa May. "As the de facto democratic leader of Myanmar and as a renowned advocate for human rights, you have a particular moral and political obligation to speak out against this appalling cruelty, and to do whatever is in your power to stop it," he wrote. "By publicly condemning the violence and taking immediate steps to protect and defend the rights of all minorities, you can help guide the people of Myanmar to surmount these deep ethnic divisions." Trudeau also outlined further steps he would like the Myanmar government and military to take, calling on the Myanmar security forces to end the violence and bring the perpetrators to justice through independent and impartial investigations. He also asked the Myanmar government to publicly welcome the return of all Rohingya refugees, alongside a commitment to address the issue of their citizenship, equality and human rights. The prime minister also asked the Myanmar government to provide the UN and international humanitarian agencies full access to the region. Officials, speaking on condition of anonymity given the sensitivity of the issue, say the federal government is reluctant to overtly blame Suu Kyi, fearing elements in Myanmar's military want to use the crisis to undermine her democratic goals. The Liberal government has been coming under increasing pressure from advocates to strip Suu Kyi of her honorary Canadian citizenship -- an issue Trudeau did not address either in the letter or when asked about it Monday. But he did quote Suu Kyi's 2012 Nobel lecture, in which she spoke of the value of kindness. "These are laudable words," Trudeau wrote. "In order for them, and your various honours, to retain any meaning, you must defend the Rohingya Muslims and other ethnic minorities in Myanmar." Federal NDP Leader Jagmeet Singh is speaking publicly for the first time about being sexually abused as a child, in the hope sharing his experience will help others.